We woke up very excited about this day. 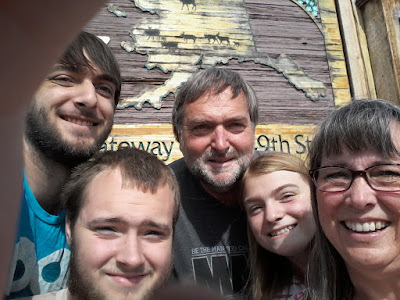 We've loved every mile in Canada, but today, we reach Alaska. The sign below is one we've come to know very well. It means, "GET READY!" Yukon Territory is not as lush as British Columbia, but it lives up to it's motto. It truly is larger than life! 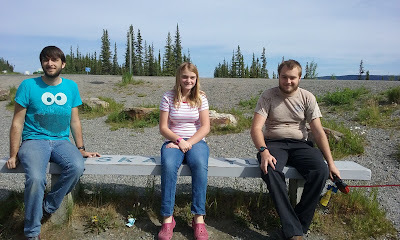 The iconic sign at the border between Canada and Alaska. Note the cleared trees....they go on and on on both sides of the highway - the line. A word about our vehicle decoration. The idea belonged to Stacia and me. We have had waves, smiles, cars slowing down to read all the comments on the trailer, people stop to talk in campgrounds and parking lots.....as we got ready to leave here, the state worker maintaining the site, came and talked to me. She had noted the "USAF Retired" sticker and all the writing on the vehicles. "Home 2 Alaska," seemed to resonate with her most. She thanked me for our service and said, "Welcome Home." I teared up. Four days later I'm still tearing up. Many know Alaska is not my first choice for retirement. C'mon, I grew up in tropical weather.🌞🍌🌴🌴🌞 However, when we lived here from 2002- 2005, God did a LASTING work in my life. He taught me how to find and choose joy....and I came to love Alaska. I didn't realize, yes, it DOES feel like home, until the moment the state worker spoke her words at the international line. Home has always been centered in RELATIONSHIPS and not a location. As a missionary child, we moved every few years. As a pastor's wife and then military spouse, we've moved every 2 - 4 years. Driving in to Alaska, having her welcome me HOME, spoke to me in ways I find hard to even communicate. (I have tears rolling down my face as I type this four days later). Our younger kids have NEVER lived in one place more than four years. The norm has been 2 1/2 - 3. Our older kids lived in Hardin, MT for 5 years and that was their longest stint as children. I tried to share my thoughts with Nolan as I sniffled my way to the border crossing. I was determined not to cry. We had a bit of a wait as these gentlemen had spilled diesel and were made to clean it up. I collected myself and insisted to Nolan I was crossing the border without crying. The guard did her thing with Michael. BTW, crossing back into America was far more stringent for us than crossing into Canada - contrary to what we've heard from others. This guard DID have a sense of humor and we joked as she went about what she needed to do. As we left she said, "Welcome Home to Alaska!" We talked in Tok, at Fast Eddies, and most, if not all, of us teared up. We are all feeling it - a connection to Alaska, a sense of, "This is home. This is where we belong." A thankfulness, while we may choose to travel or move in our olden golden years, this is a place we can put down roots that won't be up heaved in 2 - 3 years. Stacia has said it in many ways as we introduce her to Alaska.... "I can make friends here and not have to say quick goodbyes." And so it does come back to relationship in the end - for some of us. 😉 My heart still longs for Japan, but my heart is also content to be here, in Alaska. I'm excited to see what God has in store for us here. We traveled on. Beautiful Alaska. Though I have no picture, it was THIS day that the bikes bounced around so much as we went up and down hills and ledges....they hit the back window of the Jeep. We stopped to make sure all was still strapped well - it was. We just had some major bounces. We saw wildflowers and wildlife. I'll document wildlife in "that post." We were happy to stop in Glenallen and process the thoughts and emotions of the day. It was good to savor before we press on to the Valley/Anchorage area. I sit this morning and sip tea from my favorite PWOC mug - reminded I'm "Rooted in Christ," affirming home is in Christ and relationships....and so very thankful for a season to discover the delight of being at home in Alaska. God, in a plan we never saw coming and certainly didn't attempt to manipulate, saw fit to migrate all but one (possibly two) of the Gherkins to Alaska. Yes, we wish more extended family would catch the bug, but they'll visit. Michael has always wanted to come back here. I have wanted to be in Texas...BUT... my biggest retirement location requirement was to be within a day's drive of kids....and now we get both.....amazing plan, this. And still, I renew my agreement with God to hold plans in open hands. If you're interested in video highlights - click here.